OpenGov recently caught up with Zaqy Mohamad, Chairman of Government Parliamentary Committee for Communications and Information, MP for Chua Chu Kang GRC, Singapore, to hear his take on the Smart Nation vision and learn about the many ways he is involved in making this vision a reality. Mr. Mohamad has been a Member of Parliament since 2006, serving Chua Chu Kang GRC. He currently serves as Chairman for the Government Parliamentary Commitee (GPC) for the Ministry of Communications and Information and a GPC member of the Ministry of Transport. He has served in the GPCs for Ministry of Manpower, the Ministry of Trade and Industry, and the Ministry of Finance, as well as the Public Accounts Committee. Mr Mohamad began his career as a business consultant in Arthur Andersen and IBM, and subsequently moved to a career in sales in Avanade and Dimension Data. Presently, he works in Ernst & Young as Director, Asean Business Development. As sitting Chairman of the Ministry of Communications and Information, Mr. Mohamad is on top of the technology trends which are affecting the Singapore Smart Nation vision. “We are going in the right direction as a nation. Many nations are looking at many of the aspects we are focused on,” said Mr. Mohamad. Mr. Mohamad is currently serving on the Committee on the Future Economy. The mission of the CFE is to come up with economic strategies which will position Singapore well for the future economy. The CFE aims to help sustain a vibrant and resilient economy throughout the nation- which sustains growth, creates values, and offers opportunities. 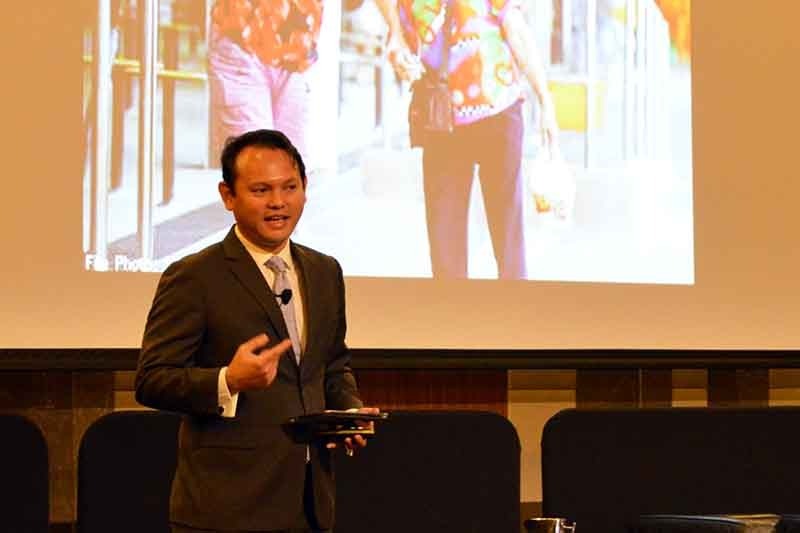 “What I am doing today, through the Committee on the Future Economy of Singapore, is trying to project the technologies which may change the landscape of the economy,” Mr. Mohamad stated. The CFE plays an important role, as the Singaporean economy and its citizens are not immune to technology disruption. The Singapore Government is looking at this situation very closely, as it is understood that technology disruption will change the career landscape for many Singaporeans. As part of the Smart Nation vision, Singapore must be prepared to take advantage of these circumstances. In addition to this, the Government must also be prepared to embrace the onset of big data and analytics. The Singapore Government must take advantage of opportunities posed by big data and analytics as they will drive the Smart Nation vision forward. Already, the Singapore Government has established data.gov.sg, an open data portal, to exploit benefits from big data and to drive a more open data mind-set. “IoT and data analytics present a lot of opportunities in sectors such as transportation and healthcare. A lot of these technologies are sensor-triggered, helping us make better informed decisions. What is more important is for us to make sense of this information,” Mr. Mohamad told us. With this, Mr. Mohamad recognises the impact that the information age may have on the evolving workforce in Singapore. Citizens who were trained several years ago, may find that their skills are outdated or no longer in demand. Singapore’s Government is addressing these implications posed by technology in a variety of means so they can ensure a better future for working citizens. “It is more likely that automation will take over several job roles whether it is reporting or analytics. As a country, we are thinking about how to manage that and reskill or retrain your workers to move them to new sectors,” Mr. Mohamad stated. It is anticipated that Government will be working with the private sector to drive some of these ideas forward. “We have seen a lot of initiative in government today, in terms of optimising policy and analysing trends. Moving forward, as we collaborate with industry, we hope that they will also use government data to enhance their industry,” said Mr. Mohamad. Mr. Mohamad was able to bring some of his skills and expertise to Perth, Australia where OpenGov hosted its annual Western Australia OpenGov Leadership Forum. He was also able to gain some new learnings from the Western Australia Government, as they are embarking on a new ICT Roadmap. After our chat, Mr. Mohamad shared some of his forum takeaways with us. “I am quite heartened by the progressive nature of the Western Australia Government. They recognise that they need to collaborate more in order to function more effectively. Similar to a country like Singapore, small government bodies who work together can get so much done very quickly,” Mr. Mohamad stated. Speaking with Mr. Mohamad gave us a clearer perspective on how the Singapore Government perceives the future and what it is aiming to do in order to face it head on. We look forward to following Mr. Mohamad as he helps Singapore attain its Smart Nation vision.